I’m tempted to start this rare departure from my usual beat at WBEZ with a musical crack recounting the most hateful thing that has been said about our mayor during his battle with the Chicago Teachers Union —“RAHM EMANUEL LIKES NICKELBACK”— but this strike is no laughing matter (a statement from a mayoral spokesperson to Red Eye countered that Emanuel does not, in fact, like Nickelback). The real issue here, often obscured by all the noise from both sides, is vital to every parent in this city, and indeed the entire country: the future of public schooling. My soon-to-be-16-year-old daughter was planning on marching in support of her teachers at Lincoln Park High School (pictured today on the front page of The New York Times) even before I broached the subject with her. For that — and for the three hours we spent walking and chanting with two of her classmates, other parents, their kids and what she said looked like every faculty member at the school — I never have been more proud of her. 1. A poll commissioned by my former employer, The Chicago Sun-Times, may show that only 47 percent of Chicago voters support the strike, but the ratio of drivers, bikers and pedestrians honking their horns, raising their fists in solidarity or shouting their support was more like four out of five or 80 percent, which, needless to say, was enormously encouraging to all of those educators in red. 3. Every one of the two dozen teachers I spoke with at length did a better job of articulating the issues at stake and the reasons why they’re on the street when they’d prefer to be in the classroom than union president Karen Lewis or vice president Jesse Sharkey has done to date. As a media professional and a college English teacher, I’d have to give Lewis and Sharkey a “D” as communicators. I’d contrast their public statements to, say, those of the Chicago librarians’ reps when they fought the mayor last year. Those guys earned at least an “A-” for getting their message out loudly, clearly and with a consistent focus. The teachers union needs to perfect the way it presents its message, and quick. The court of public opinion will be every bit as crucial as the bargaining table in resolving these issues. 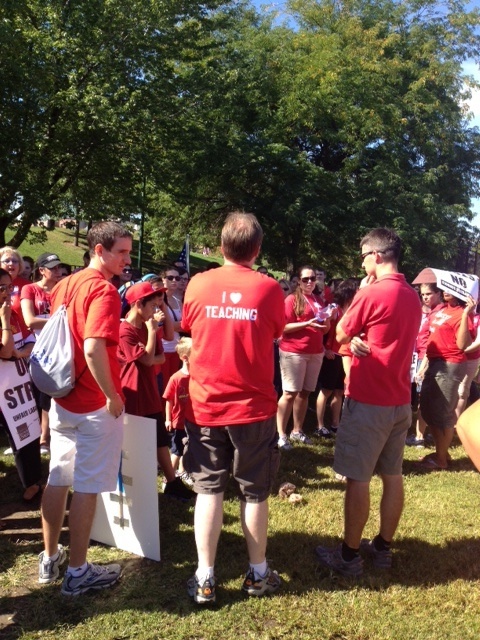 So, what did the teachers at Lincoln Park High School say their gripes were? No one mentioned money — not once. Nor did anyone say that principals should not have the right to fire negligent or ineffectual teachers. They’re arguing that standardized test scores should not be the dominant factor in evaluating teachers, not when there is no “standard” in the countless challenges facing students outside the classroom in schools throughout this vast and diverse city, from the most troubled on the far South Side to the most privileged on the far Northwest. The teachers I spoke to said that good teachers at schools closed because of declining enrollment or consolidation — many of them educators with years if not decades of experience and positive evaluations — should be first in the pool of those to be hired at other schools. Principals at these schools should not be able to go first to the cheaper first-year teacher just to put a body in a classroom. Hard work, good performance and consistent service should be considered and rewarded. They’re saying that resources such as libraries, school nurses, guidance counselors, social workers, arts and music materials and air conditioning are vital to the educational experience, and they’re all being cut to the bone or were never there for students in the first place. And, most importantly, they’re saying that charter schools are not the answer — not when so many reliable reports hold that charters have not been proven to be any better than public schools. As a parent who believes in public schooling, it offends me to the core to see these educators being disrespected as they are. And it offends me even more that Mayor Emanuel has chosen to send his three children to one of the most expensive private schools in the country, the University of Chicago Lab Schools, which costs an average of more than $25,000 a year per student. This personal choice sends a very public message: The Chicago Public Schools are good enough for more than 400,000 of your kids, but they are not good enough for mine. I honestly do not believe my daughter would have gotten a better education at the Lab Schools or anywhere else. 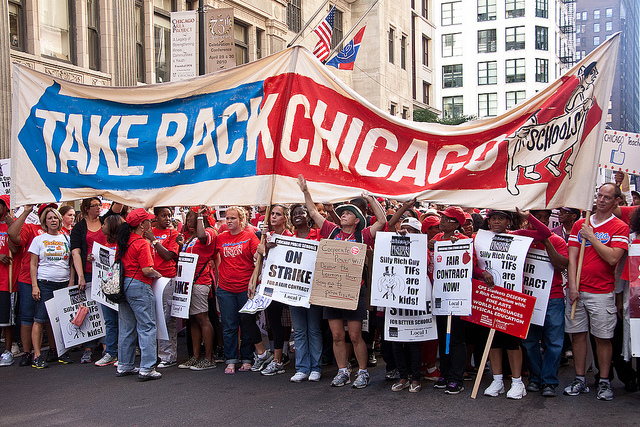 And I believe the Chicago teachers deserve to be treated with the respect they’ve earned for that. P.S. To bring it back to music, I’d direct teachers on the picket lines to this playlist of 12 timeless rock songs in support of workers compiled by my friend, Sun-Times rock critic Thomas Conner. Because nothing helps more than music when the time comes to hang tough.